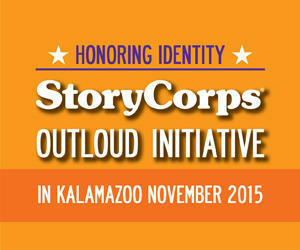 WMUK will host StoryCorp's OutLoud Initiative in Kalamazoo on November 5, 6 and 7. The StoryCorps Outloud Initiative is designed to capture the stories of members of the LGBTQ community. If you and someone you know are interested in recording your story for OutLoud, you can find information about registration through the Kalamazoo Gay Lesbian Resource Center website.